and break up tomatoes. Cook 10 to 15 minutes, adding beans and fish during the last 5 minutes of cooking. If using frozen seafood portions, rinse any ice glaze off under cold water, then add seafood to soup during the last 5 minutes of cooking. 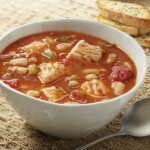 This soup is excellent with Alaska Pollock and Cod, too!